It’s not often that I listen to Democracy Now! and come away not feeling depressed. However, today’s show featured three stories highlighting the difference people can make against big media, big oil and conservative politicians. The first story was about the internet backlash against SOPA and PIPA. It included a discussion between Wikipedia’s Jimmy Wales and the Copyright Alliance’s Sandra Aistars. It has been incredible seeing all of the Congresspersons change their minds on these bills so quickly. Yesterday we saw the power that the people have to use the internet – and their voices – to change things. The segment also included a snippet of a TED talk by NYU Professor Clay Shirky on Why SOPA is a bad idea. The second story was about the Obama Administration’s decision to not approve the Keystone XL pipeline. 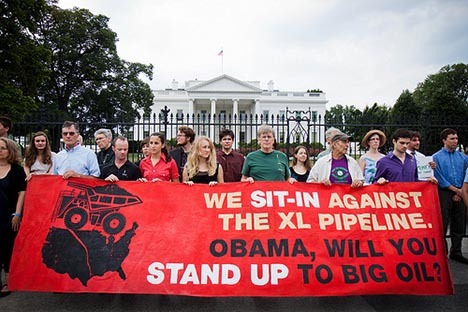 It included reactions from Jane Kleeb of Bold Nebraska and 350.org founder Bill McKibben. They both know that this isn’t the end of the pipeline, but for today, the people won against big oil. Finally, to Wisconsin, where over 1 million signatures were collected in the recall drive against Governor Scott Walker. This was almost twice the number needed to start the recall process and equalled almost half the number of people who voted in the 2010 election in Wisconsin. John Nichols, from the Nation Magazine, remarked about the significance of this accomplishment in Wisconsin. He also remarked about the People Powered Moment in the three stories on the show that day. In his book Locked in the Cabinet, Former Labor Secretary Robert Reich remarked (I’m paraphrasing here) that if we weren’t involved in the political process, there were other people who would be happy to do it for us. I have wrestled with this idea for a long time. There are times when I want to turn away from it all and say it doesn’t matter what I say or do, the corporations and big money interests always win. But the lesson of the last year, and specifically today, is that they don’t always win. Bill McKibben talked about all of the money that big oil and the Chamber of Commerce spent trying to get the public to believe that the XL pipeline was necessary and buy votes in Congress. But the voices of the people drowned them out. Occupy Wall Street changed the conversation in this country almost overnight from reducing deficits to income inequality and getting money out of politics. No wonder the politicians wanted them off the streets and out of the parks. For me, today is a reminder that being involved in the political process is not the horse race and making sure I vote. It is about staying involved and engaged and vigilant. It is about finding creative ways to make our voice heard and create positive change.